Back in December of 2014, a courageous man made the long trip from the San Francisco Bay area to Guam, to accuse Apuron of having abused his cousin while he was the pastor in Agat. The Name of this man is John Toves. His trip and his confronting the Chancery powerful and evil administration of Apuron, soon became the ripple which grew to a tidal wave. 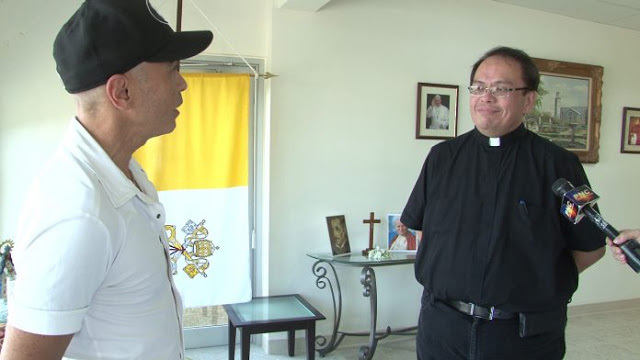 Because of his accusations against Apuron, which were well publicized in the local media and in the USA, John was soon contacted by several individuals who also had been abused by Apuron while he was posted in Agat as a priest. They were to become the Agat Boys. Six Months later, one after the other, the Agat Boys would take the public stand and accuse Apuron. Soon after, our cowardly Archbishop would leave the island to reappear in Rome, in an effort to fight the tide, to no avail. Apuron has not set foot on the island since. The putrid Pius, the man of the shadow, was forced to leave, and Cristobal the evil emminence grise of Apuron is also on the run, after being accused of abuse himsel, by several victims. John Toves testified for the Canonical Tribunal led by Cardinal Burke, who ultimately found Apuron guilty. 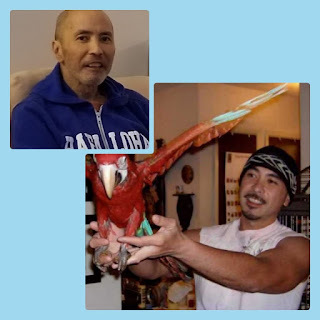 John was glad to do so, despite having been diagnosed with a rare form of cancer. Over the last three years he has fought the good fight, while getting ready for his next life. Unfortunately for his family he is nearing the end of his passage on this earth, and has taken to an hospice in the Milbrae area. John has shown us that a single individual who is unafraid could move mountains. Lets Pray for him, that he can be at peace and pass into a better world surrounded by the people that love him, and the numerous people who appreciate what he did for our Church here on Guam. Knowing John, he most likely will be as late as possible for his meeting with St Peter. Thank you John for all what you did for us. Thank you John for showing us the great strength you possessed and encouraging others that the truth is all that matters. May God continue to guide you and welcome you in your next journey. 🙏🙏🙏 for my nephew with love. May God bless and embrace you. Did John's cousin publicly came out to finally accuse the bishop? Dear "publicly came out" (smh), No. He prefers not to relive the pain. Apparently the Vatican (and now the Pope) had no need of John's cousin as there were plenty of other victims and accusers. For real Catholics, there is no such thing as Karma. There is only Divine Justice. "Vengeance is mine," says the Lord. My Prayers for you John, May you behold the face of our Lord who is the Way, the truth & the life. Words can't express my gratitude. Thank you for your courage. I was able to see God's truth and justice shine through you. May the holy spirit inspire us to have courage and trust in God the way you had. Sending my prayers. Thank you God for the opportunity to have followed him in this journey.